BRENHAM, TX (KTRK) -- Did you know that bluebonnets aren't always blue? ABC13 viewer M.J. Pittman sent in this incredible shot of a rare albino bluebonnet while out in the Brenham area. 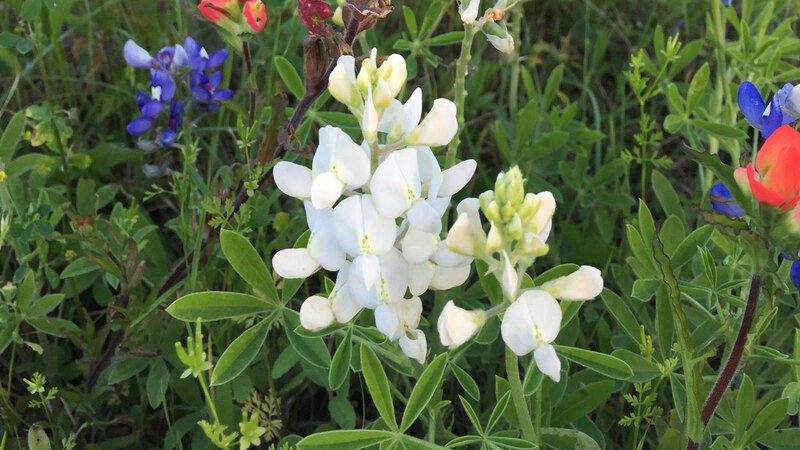 M.J. says this gorgeous white bluebonnet was out hiding among the wildflowers. Officials at the Texas AgriLife Extension Service at Texas A&M University say white bluebonnets were once relatively unknown to Texans, but began popping up when the state began its contemporary bluebonnet seeding project in 1986. Some naysayers believed it would take years to purify the strain of these white beauties, but surprisingly, 75 percent of the plants bloomed white only a year into the seeding project. Even rarer, scientists say, is the pink-colored bluebonnet. Carroll Abbott, who suggested the bluebonnet project ahead of the 1986 Texas' Sesquicentennial, allegedly only saw three pink bluebonnets after roaming the fields of Texas. The State of Texas originally began its bluebonnet seeding program in the 1930s, according to the Texas State Historical Association. The flower was adopted by the Texas Legislature as our state flower back in 1901. Show us your bluebonnet photos: Send photos by emailing them to news@abc13.com or post them using #abc13eyewitness.